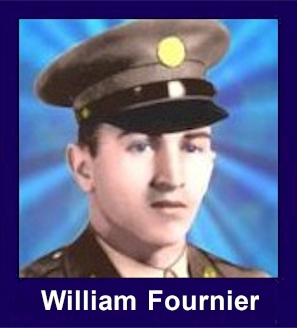 The 35th Infantry Regiment Association salutes our fallen brother, SGT William Grant Fournier, who died in the service of his country on January 10th, 1943 in vic. Mount Austen, Guadalcanal, Solomon Islands. The cause of death was listed as KIA. At the time of his death William was 29 years of age. He was from Norwitch, Connecticut. The decorations earned by SGT William Grant Fournier include: the Combat Infantryman Badge, the Medal of Honor, the Purple Heart, the Asiatic-Pacific Service Medal, and the World War II Victory Medal. General Order No. 28, 5 June 1943. William is buried in the National Memorial Cemetery of the Pacific in Honolulu, Section C. Grave 462.